Just in case all of the decorations that shot up on November 1st didn’t tip you off, but the holidays are coming. The holidays usually mean lots of family members and friends getting together at one person’s house to eat gobs and gobs of food. If you happen to be hosting one of those gatherings, you might need a few easy ideas of foods that you can serve to those hungry guests. For a classy and tasty appetizer, you can turn to Alouette Cheese. Alouette, the number one brand of spreadable cheese in the United States, eliminated all artificial flavors, colors and preservatives from its complete line of soft spreadable cheeses. This makes Alouette the only brand to offer 100% all-natural spreadable cheese flavors, with 11 varieties available in the specialty cheese case of supermarkets and grocery stores nationwide. Flavors include: Garlic & Herbs (made with fresh garlic), Light Garlic & Herbs, Spinach Artichoke, Sundried Tomato & Basil, Savory Vegetable, Creamy Onion & Shallot, Peppercorn Parmesan, Light Cucumber Dill, new Sweet & Spicy Pepper Medley, Berries & Cream (seasonal) and Cheesecake (seasonal). Popular serving ideas: Garnish a spoonful onto grilled chicken or hamburgers; top baked potatoes or fold into mashed potatoes; or, top grilled or toasted bread for a twist on traditional garlic bread. 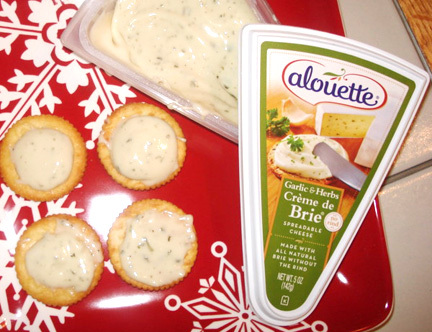 WiC Chick Cheryl decided to put Alouette Cheese to the test when she picked up the Alouette Crème de Brie in Garlic & Herbs from her local Randalls. I remember from my last review of Alouette that their cheese’s are full of flavor that was popular with both the kids and the adults, and I was curious to see if another set of testers would come to the same conclusion. From the moment that Cheryl and her family opened the wedge-shaped container, they could not wait to taste it. On first appearance, the cheese has a smooth and creamy texture, with flecks of the herbs visible in the cheese. There wasn’t a strong smell, even with the garlic and herb flavors. After opening the re-sealable package, it was time to dive in. Cherly & Co. tested the cheese with some crackers although you could also use the Alouette Crème de Brie in Garlic & Herbs to top your burgers or for baking as well. The entire family loved it. They found that the texture of the Alouette cheese was exactly how it looked, creamy and easy to spread. The taste was well balanced with the garlic and the herbs and was not overpowering. Cheryl detected a hint of saltiness at first, but found that she could not stop eating the cheese. It was so popular, that the family is asking her to purchase even more Alouette Cheese. Alouette Cheesecake is an all-natural, dessert-inspired spreadable cheese. The new flavor adds the perfect complement to graham crackers, vanilla cookies, bagels and fresh fruit. 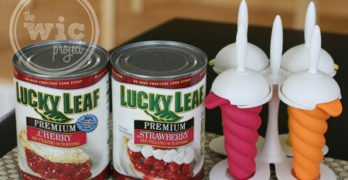 It can also be used in holiday baking to create sumptuous desserts. Perfect for kids and adults, for small or large gatherings, during casual or special occasions, Alouette Cheese offers a high quality, great tasting cheese that will have your guests asking for more. Two winners will each receive TWO FREE COUPONS for Alouette Cheese. Visit www.alouettecheese.com and leave a comment with the type of Alouette Cheese you want to try the most. For one bonus entry, “Like” Alouette Cheese on Facebook or follow Alouette Cheese on Twitter. Feel free to let them know The WiC Project sent you. For one more bonus entry subscribe to The WiC Project via reader or via email and/or “Like” The WiC Project on Facebook. Please leave a comment letting me know that you have. Giveaway ends at 11:59 PM EST, November 16, 2010. Disclaimer: This post consists of my (and/or fellow tester) opinions only. Your experiences may be different. No compensation was given for this review/giveaway. Cherly did receive a free product from the manufacturer or their representing PR agency to use and test for the purposes of this review. This did not affect the outcome of this review. I would like to try the Alouette Baby Brie w/herbs. I’d like to try the Alouette Soft Spreadable Savory Vegetable Cheese. The Spinach Artichoke sounds good too! Thanks. I’d like to try their Creme de Brie. I’d like to try the Alouette Baby Brie. I’d like to try Feta Mediterranean. I would like to try the Sweet & Spicy Pepper Medley soft spreadable cheese! I love the Garlic & Herbs. Garlic and herb sounds yummy! I would like to try the Soft Spreadable Garlic and Herbs. I most want to try the Soft Spreadable Cheese in the Spinach Artichoke flavor. I would like to try garlic and herb. I already love the garlic and herb spreadable!! I like their garlic and herb spreadable cheese. I’d like to try the Garlic & Herb Spreadable. I like the feta- original. I would pick the limited Cheesecake. For a picnic of wine and cheese, I’d try Alouette’s Baby Bree. Garlic & Herb baby brie sounds wonderful! I would like the Alouette Crème de Brie in Garlic & Herbs . The crumbled feta on asparagus with balsamic vinegar sounds good to me!! I would like to try the garlic and herb soft spreadable cheese. Crème Fraîche. I’ve always heard about fancy people eating it, btu I’ve never tried it. I would really like to try their Sundried Tomato & Basil spread. It must taste delicious. I would love to try the Soft Spreadable Cheese – Light Garlic & Herb. Thanks! I would like to try the Soft Spreadable Savory Vegetable Cheese. I liked alouette cheese on facebook! The garlic herb spreadable would be my first choice. I would like to try the fine herbs creme de Brie. Love Brie. I want to try the feta crumbled cheese. I would love to try the limited edition Cheesecake cheese to serve at holiday parties. The Garlic and Herb Soft Spreadable Cheese is my item of choice! i liked you on fb. username audrey shay. I would like to try the Light Garlic & Herbs spreadable, but that cheesecake looks tempting! I would like the Garlic and Herb Spreadable Cheese . I’d love to try the Light Garlic & Herbs spreadable cheese! Thanks!! I would love to try the baby brie. I love brie. I follow Alouette on twitter. I would love to try the Peppercorn Parmesan. I would like to try the baby brie with herbs. I would like the Baby Brie. THIS COMPANY DONT KNOW HOW TO RETURN phone calls!!! AT all ive called past 2 days WEEKDAYS no less and still no call bacl!!! do not try to call this company they DO NOT BELIVE IN RETURNING YOUR CALLS BEEN CALLING FOR 4 DAYS straight EVEN CALLED ON FRIDAY NUMBER OF TIMES THEY DO NOT CALL YOU BACK!! !